The fourth-largest island in the Mediterranean and reputedly its most mountainous, Corsica offers a degree of wildness rarely found on the Mediterranean’s well-tamed continental coastlines. 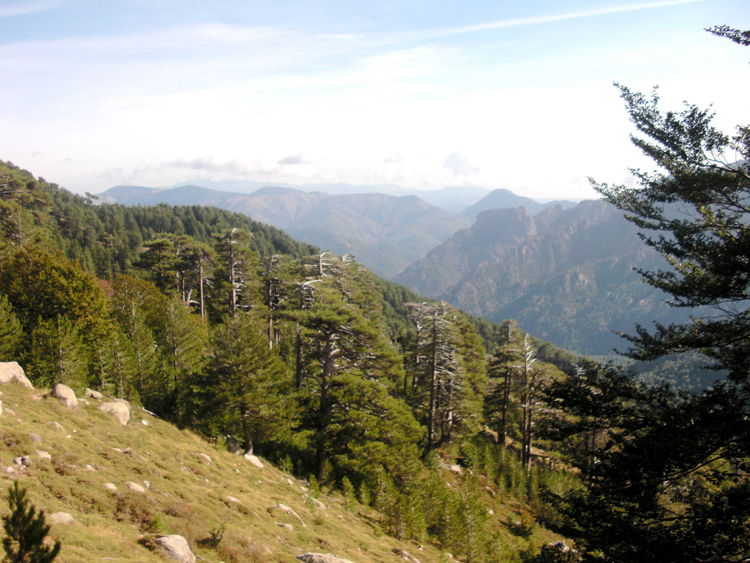 Its huge areas of wilderness are full of magnificent forests and the unique and beautiful maquis scrublands. Throw in an interesting history, ancient villages and routes and delicious food, and the potential for walking joy is huge. The island is host to a series of glorious high, long, walks and a generous number of easier day-or-less-strolls. A form of walking paradise. The fourth-largest island in the Mediterranean and reputedly its most mountainous, offers a degree of wildness rarely found on the Mediterranean’s well-tamed continental coastlines. Its huge areas of wilderness are full of magnificent forests and the unique and beautiful maquis scrublands. Corsica furnishes a series of glorious high, long, walks and a generous number of easier day-or-less-strolls. French by administration, Italian and north African by both [emotion and geographical location], mentioned in Roman and Phoenician myth, Corsica has a complicated history. The birthplace of Napoleon, it has been a territory of France for some 250 years, though its larger neighbour, Sardinia, is Italian and it was previously controlled by the Genoese for some 400 years. It lies only 70km from Tuscany, and 170km from the nearest landfall with its governing country. Like many important Mediterranean islands, Corsica has been squabbled over by many civilisations, all the way back to the Phoenicians, while its indigenous inhabitants have obdurately shrugged and retained their own culture. Famous, for many years, for the ferocity of its bandits and its gun-toting independence movement, the island, as a consequence, has avoided much of the more unsympathetic development that affected Europe’s Mediterranean coastline during the pre-conservation years. This, however, is country that, beyond its coastal regions, is particularly unconquerable, and unprofitable to subdue: its rugged interior unsuitable for road-building and its potential for profitable agriculture limited. Until the 19th Century, when the spectacular narrow-gauge railway was built, the only way to get from settlement to settlement was via the web of footpaths and mule and stock tracks that still exist – some of them still, in fact, fulfilling their original functions – intact today. Much of it too rough to have been exploited and now with a large natural park in is heart, this island offers a degree of wildness rarely found on the Mediterranean’s well-tamed continental coastlines. Much of Corsica remains truly wild, unspoiled mountain country, rich with the scent of herbs, cooled by high forests and riddled with ancient footpaths: a walker’s paradise affording spectacular isolation and a remarkable view, a bucolic detail or a geological wonder round nearly every corner. The unique maquis scrubland is fragrant with rosemary, thyme, lavender and myrtle, and you are guaranteed sights of rock roses, strawberry trees (a type of heather), holm oaks, cork oaks, with, higher up, the chestnuts that were so vital to the Corsican economy and magnificent forests of local Corsica pine, birch, beech and much else. Fauna includes the indigenous mountain goat, the mouflon, wild boar, harmless but hissy snakes, huge kites and tiny finches, hoopoes, the splendid bearded vulture (lammergeier – 4 breeding pairs in 2017, Walkopedia got lucky and saw one in 2018), with its 2.7m wingspan and, in the central mountain chain, eagles. 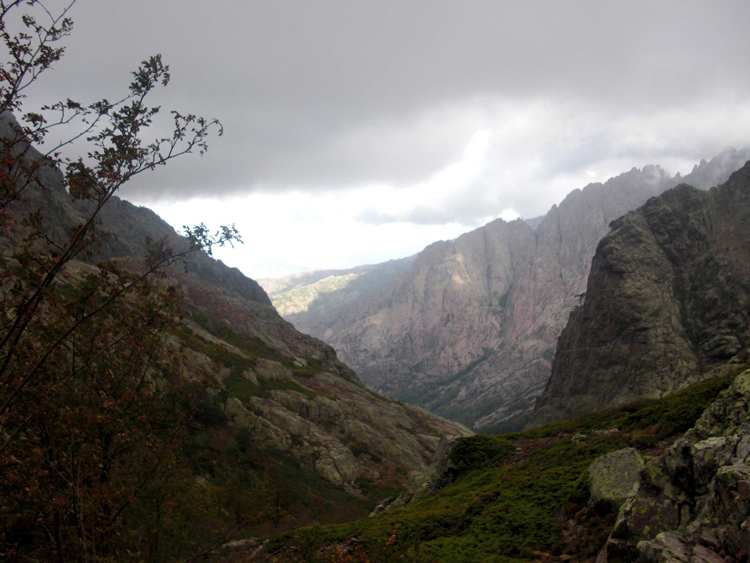 Corsica has ancient and largely granite and other igneous geology. It was once thrust as high as today’s Alps by the Africa-European techtonic impact, then subsided into its current crazed state when the pressure zone moved north. The island is host to a series of glorious high, long, walks and a generous number of easier day-or-less-strolls. A form of walking paradise.`It offers a range of walks that will satisfy anyone from the most determined to the most timorous – everyone, because the interior has remained relatively undeveloped and a remarkable diversity of flora and fauna still flourishes here, offering some aspect, viewpoint or experience that makes it well worth the effort. 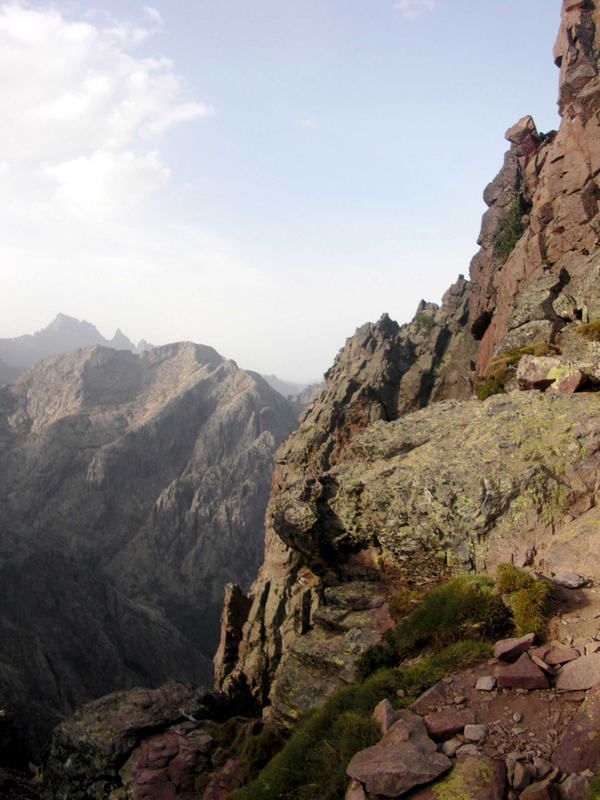 Corsica has several outstanding long distance trails, explicable in part by its complicated and thrilling landscape, and its huge variety for such an landmass. 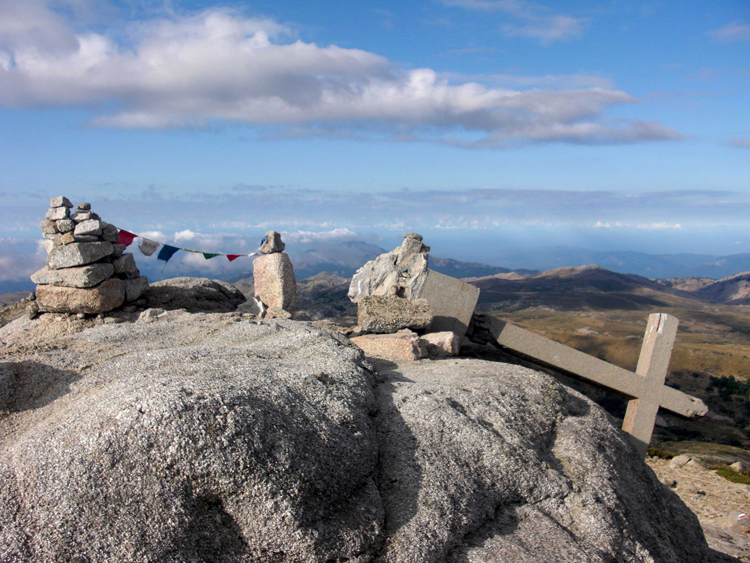 Lording it over the all, the GR20 ​– reputedly Europe’s toughest long-distance walk – runs for 180km north-south along the length of the island’s mountainous spine. It takes up to 15 days, although the nutters aim for 8. Tough it may be, but this walk, with its staggering views and regular geological marvels, should appeal to a far wider audience than the desperate peak-baggers. Less time-consuming is the 10-day Mare e Monti, one of Corsica’s most celebrated trails, described in the excellent Cicerone guidebook as “easily the most wonderful long-distance route in Corsica”, and it more than deserves its reputation. It runs near(ish) to the west coast, snaking inland and back out to the sea, from Calenzana, 12km inland from Calvi on the North-west coast, to Cargèse 125km further south. This, too, is a tough switchback of a walk – which rewards with breathtaking sea-and-mountain views at every turn. 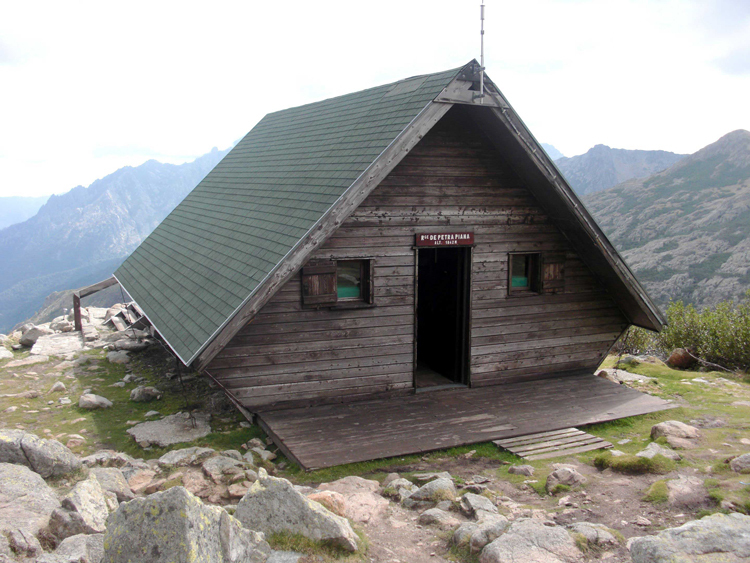 The long-distance routes, the GR20 and Mare e Monti in particular, can be tough – sometimes more of a scramble than a walk – and pass through remote mountains (where frequent bad weather is notorious) on which you will have to be self-sufficient (GR20) or at least carry sleeping bags and overnight kit (Mare e Monti and Mare-Mare Nord). Be prepared! A cove-to-cove trail near St-Florent in the far north. The marvellous Capu Rossu promontory on the north-western coast. The crazy limestone cliffs near the extraordinary natural harbour of Bonifacio in the far south. The charming and remote Girolata fishing village on the northern west coast, set in marvellous scenery and maquis; day 4 of the Mare e Monti, but walkable as a marvellous day walk too. An equally tough southward slog on magnificent high ground toward the Refuge Tighiettu. If you head on down to the refuge, a return same-day walk would be a major undertaking. You can head on south along the GR20 for a magnificent crossing to the Col de Vergio roadhead in 2 days. If the infamous Cirque de la Solitude ever re-opens, those with goodheads for heights and some risk appetite could make a brilliant circuit to Tighiettu via the Solitude, returning on the current GR20 route. The area around Col de Vergio on the watershed ridge in the central highlands, where you can stay and do several days’ stunning walking; walk on the GR20 up the dramatic Golo valley to Paglia Orba and its fellow peaks; follow the GR20 trail south, traversing delightfully through beautiful forest, then climbing to the central ridge and onward to a high col (at 1,825m) before dropping to admire the lovely Lac de Nino in its damp high bowl (head onward along the GR20 to the upper Tavignano and Restonica valleys?) ; and some other delights. Calacuccia to Tavignano across the Bocca Arinella. 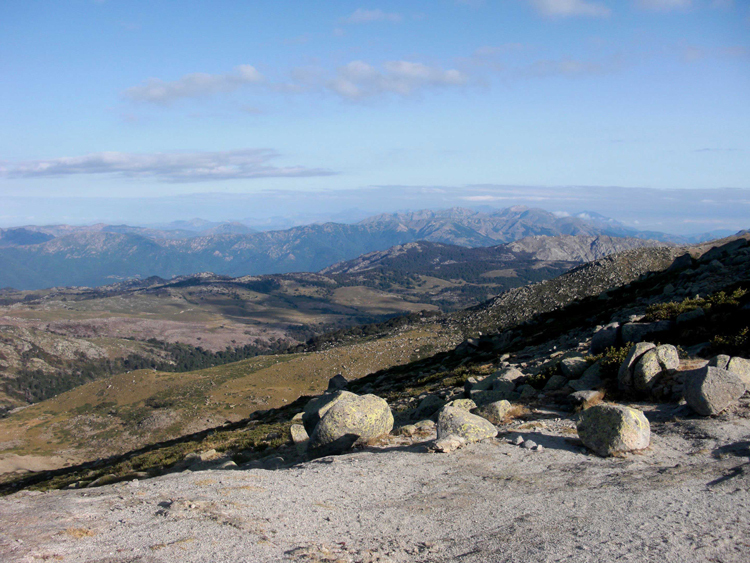 The Mare a Mare Nord turns south from Calcuccia in the Niellu Valley to cross the high southerly ridge at the 1,592m Bocca Arinella, the highest pass on the MMN with vast views north-west to Corsica's highest mountains and south over the remote Tavignano valley. This is a long (800m) climb, but a reasonably steady one. A 400m descent into lovely woodlands gets you to the wonderfully sited riverside Refuge A Sega, which serves food. (12.5km, 5.15hr). 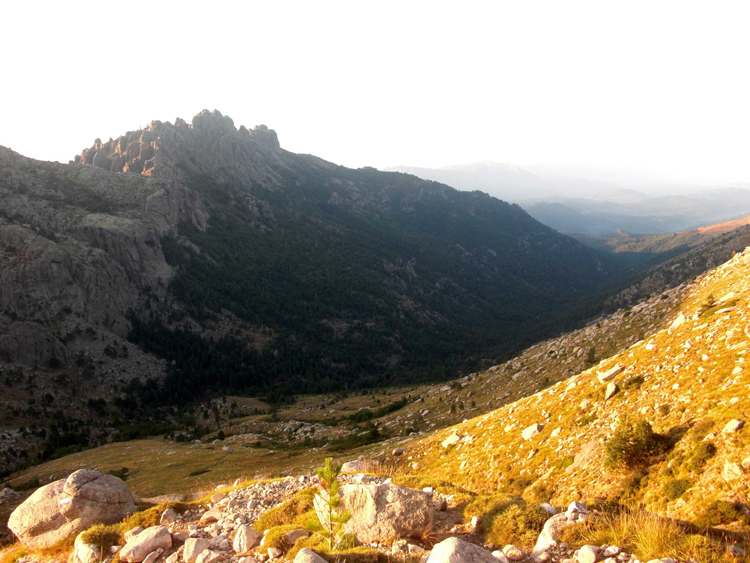 The Restonica valley, also near Corte, with its pair of stunning lakes in their deep glacial cirques, forests and peaks; half day, with outstanding onward circuits and walking options. Serriera to Ota: a long uphill grind gets you to the high Bocca San, where the views explode spectacularly; a high traverse then a long and steep descent down a superb ravine followed by a traverse to the gites at Ota, which is beautifully sited overlooking a huge bowl surrounded by a high craggy ridge. (11km/6hrs) While it is part of the Mare e Monti trail, this is such a good walk, it has its own page. 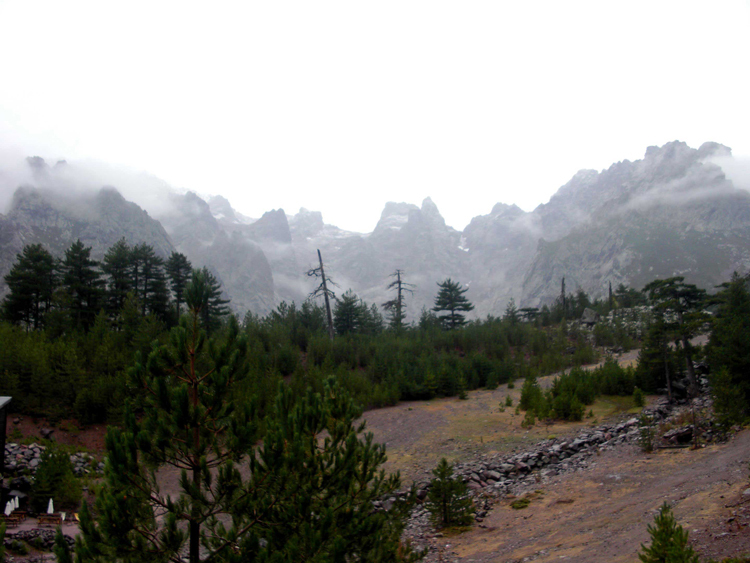 E Case to Marignana (17km, 6.5hrs strenuous.) 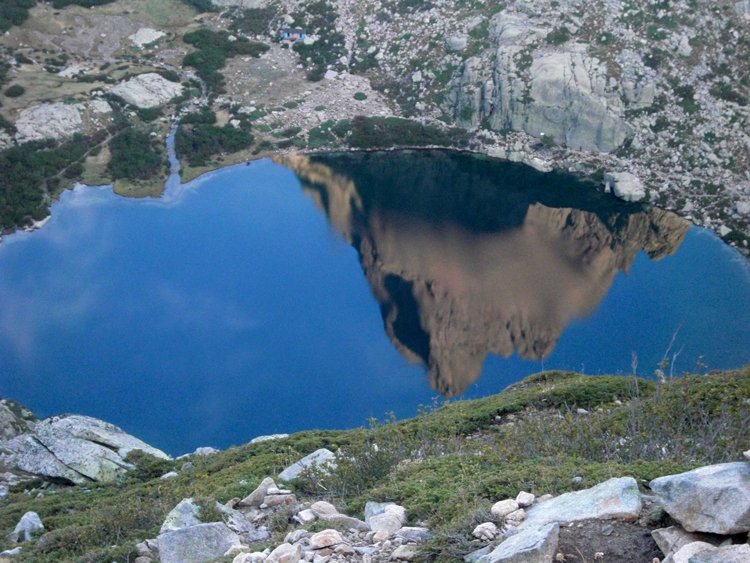 This walk is on both the Mare a Mare Nord and the Mare e Monti, but is so fine that it merits its own page. The trail traverses, then climbs to emerge above the tree line on the craggy southern slopes of the high ridge of the great semi-circle of mountains that you see from Ota. You traverse behind these, before descending delightfully to Marignana. The area south-east of the Col de Bavella, including the Trou de la Bombe area. 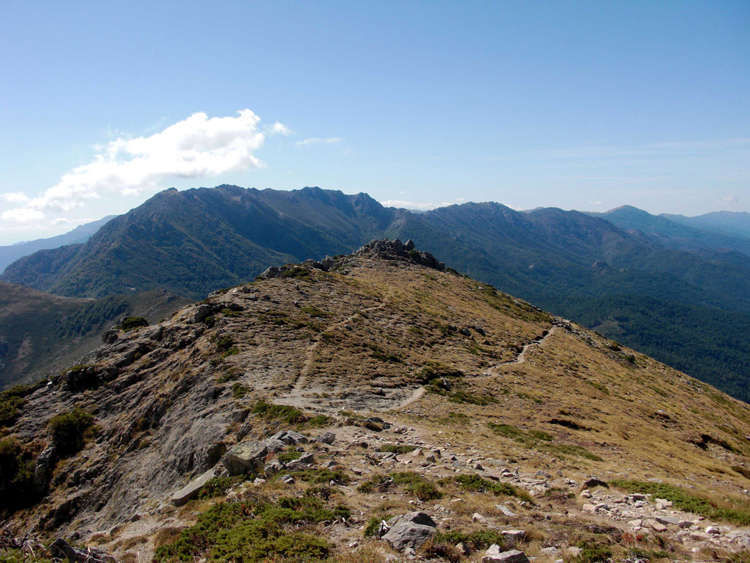 Follow part of the GR20 to the Foce Finosa. The deep, beautiful Spelunca Gorge between Ota and Evisa on the Mare e Monti in the north-west: a 650m climb/drop, and popular in high season, but a stunner. Crossing the flanks of the Niellu valley, on the Mare-Mare Nord from Calacuccia to Col de Vergio, and on the next day from Col de Vergio down through the superb Aitone forest to Evisa. The wild, beautiful Tavignano Valley on the Mare-Mare Nord near Corte. The easy walk along the lovely valley from Vizzavona to the Cascade des Anglais further south, and the relatively easy walk to the gorgeous (but popular) Piscia di Gallo waterfall. A walk around the extraordinary spires and formations of the Calanche . See William Mackesy’s account of his walk in the northern mountains and north-western coast, on arguably a “perfect seven day” selection of routes. We made this walk in mid May 2018.